If you have a fearful dog, you probably read all sorts of conflicting advice about what to do about that. Everybody’s got an opinion, and unfortunately some of them include very poor methods. Even if we rule out the methods that are obviously based on aversive practices, like prong collars or shock systems, we are not out of the woods. A lot of the suggestions made regarding fearful dogs, while well-meaning, are not helpful in the long run and can easily cause our attempts to help the dog backfire. Help the dog be safe and feel safe. Use desensitization and counterconditioning to change the dog’s emotional response to triggers. Use positive reinforcement to teach the dog behaviors. Even though #2 and #3 on this list above require mechanical skills and familiarity with concepts that are new to most people, I believe that #1 is the hardest. There is this powerful mythology out there about how to deal with fearful dogs. Sadly, many of the more kindly seeming methods can still end up keeping the dog in a state of fear. Even the gentlest sounding practice, for instance, feeding the dog all her meals out of your hand, can comprise flooding if the dog is afraid of you. For many dogs without fear of humans, hand-feeding can promote your bond and teach them that great stuff comes from you. But those beneficial effects are not likely with a fearful dog, who gets put into a terrible conflict if she is afraid of you but must come to you to eat. But the cool thing is that you can use Step #1 to assess almost any suggestion that someone throws at you. Recently I read where someone had asked, “But what does ‘Keeping the dog feeling safe’ look like? What does one actually do?” I thought that was a great question. It’s one thing to believe in it, but it’s another to try to implement it. So here is my take on what generally fits into “Keeping the dog feel safe”and what does not. It might be any of the following things. Setting up an indoor potty area if the dog is afraid of the outdoors or leashes or doorways or traffic noises or….. If some of these things seem really hard, well, they are. Having a fearful dog is much more work and takes more emotional stamina than is widely known. 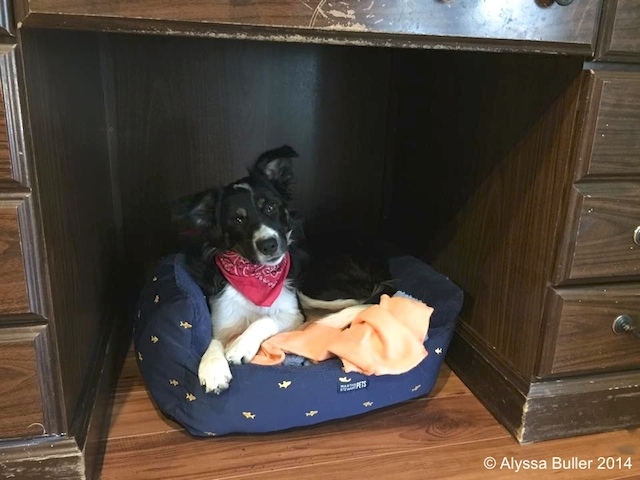 Please check out the other half of this post: a photo gallery of some of the “safe places” that thoughtful owners have created for their fearful or sensitive dogs. Will “hand feeding” petrified Sunny at this moment build a bond with him? What it doesn’t look like is any of these myriad things people suggest to try to get dogs to accept proximity to whatever it is they are afraid of, no matter how well-meaning. Don’t be dismayed. Yes, the “do’s” are a lot of work. The “don’t’s” are hard to avoid. But the better you do at helping the dog feel safe, as extreme as some of those measures seem, the faster she may be able to progress. Step #1 is powerful indeed. But it is a baseline. If you stopped there, you might end up with a dog who lived in your house with fairly low stress, but she might have very little joy in life. The point in taking steps to help the dog feel safe is so she is in a state where she can learn, little by little, using desensitization and counter conditioning, to be comfortable in her skin and happy in her life with humans. Not to mention that you get the satisfaction of knowing how much you really helped her. I’m not going to write anything about Steps #2 and #3, because they are already beautifully delineated on the CARE for Reactive Dogs website. After we do Step #1, we can use the CARE techniques just as effectively on a dog who is frozen in a corner as we do with one who is hollering at the end of the leash. And by the way, the CARE website does also cover keeping the dog feeling safe, under the Respite and Relaxation section ofPrepCARE. And if you want to learn more about the three principles listed above, you can go straight to the source. 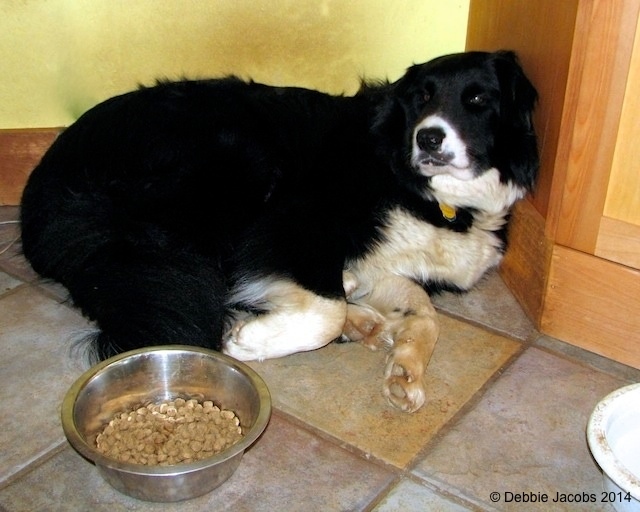 Debbie Jacobs gives a great webinar on helping fearful dogs (new dates coming soon). Also check out her in-person seminar schedule on her blog. Have any additions to the lists above? What does safety look like for your dog? my havenese/poodle cross is fearful of other dogs espcially when she’s on her lead.she barks,growls and lunges at the dog(no matter the size) other wise she loves every body.What to do?